1) Donald Trump will take credit. 2) He and a new Republican Congress will be emboldened to ram through a right-wing policy agenda more sweeping than ever: Cuts to Social Security, Medicare, and Medicaid in the name of balancing massive deficits produced by the plutocratic tax cut; full repeal of the Affordable Care Act, with millions losing health insurance; more ruthlessness toward immigrants and roadblocks for minority voters; an end to the probe of Russia’s role in Trump’s 2016 election, let alone investigation of his banana republic personal corruption; and more environmental rollbacks and prideful ignorance about climate change. Oh yeah, one more thing: an amped-up daily volume of White House ravings to perfuse the fever swamps of racism, misogyny, and anti-Semitism that now routinely erupt in violence and hate crimes. This scenario makes the outcome of Democratic efforts to flip 23 Republican-held House seats, which would transfer control of the chamber and create one impediment to Trumpism, the singular story of the 2018 election. CALIFORNIA GOLD RUSH: The heart of the election night story will rest in California, where outside and independent groups have poured more than $60 million into a handful of House races — in addition to the tens of millions raised by the candidates themselves. Dreams Democrats once harbored of capturing the Senate evaporated amid a 2018 campaign map that overwhelmingly favors red states, along with a bump for GOP incumbents following the contentious Senate hearings on Justice Brett Kavanaugh. • 25th CD (Ventura/L.A. Counties): Katie Hill, a 31-year-old advocate for the homeless (Independent 10/18/18), has received more than $15 million in outside support ($5 million from ex-N.Y.C. mayor Michael Bloomberg alone) beyond the $6 million she raised herself, strongly positioning her against pro-Trump incumbent Steve Knight. • 39th CD (Orange/L.A./San Bernardino counties): For this open seat, Democrat Gil Cisneros, a self-funding millionaire who (literally) hit the lottery, is in a tough race often focused on immigration against former GOP state legislator Young Kim, who benefits from a large number of Asian-American district voters. • 45th CD (Orange County): GOP Rep. Mimi Walters is defending her seat against liberal law professor Katie Porter, an advocate of single-payer health care who lost support from labor for backing Prop. 6, the Republican-backed measure to cut the state gas tax, an attempt to blunt Walters’ anti-government message. • 48th CD (Orange County): Fifteen-term Republican Rep. Dana Rohrabacher is considered California’s most vulnerable GOP congressmember because of close ties to Trump and fanboy relationship with Vladimir Putin; real estate executive Harley Rouda, an ex-moderate Republican, is the only strain of Democrat with a chance in this bastion of Reaganism. • 49th CD (Orange/San Diego counties): Democratic environmental lawyer Mike Levin has embraced a Bernie Sanders–like platform to win a seat being vacated by Republican Rep. Darrell Issa, battling Diane Harkey, GOP chair of the state Board of Equalization, who opposes the pro-immigrant sanctuary state law. 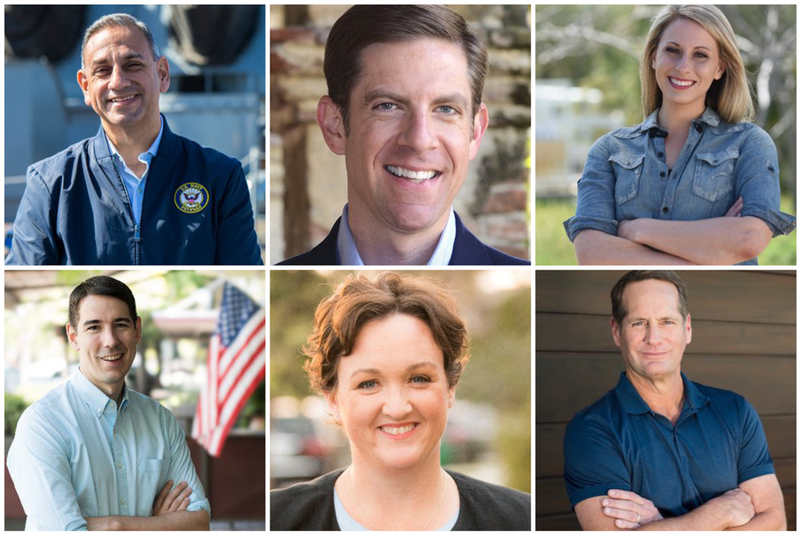 • 10th CD (Stanislaus/San Joaquin Counties): Thirty-two-year-old venture capitalist Josh Harder is in a toss-up against GOP incumbent Jeff Denham in an increasingly Latino district, where the Republican has tried to finesse immigration by advocating comprehensive reform legislation but remains open to the Democrat’s attacks on his repeal Obamacare votes. AND DON’T FORGET: Amid a likely Democratic sweep of all statewide offices (hello, Gov. Gavin Newsom) there is a modicum of drama in three races where outsiders oppose well-connected Sacramento lawmakers. For Insurance Commissioner, Silicon Valley mogul Steve Poizner seeks to become the first independent elected in California history (Independent 6/20/18) against state Senator Ricardo Lara; wealthy developer Eleni Kounalakis faces Assemblymember Ed Hernandez (Independent 10/25/18) for Lieutenant Governor; charter school advocate Marshall Tuck faces Democratic Assemblymember Tony Thurmond (Independent 8/30/18) for State Superintendent of Public Instruction.